When the payload and towing needs are above the light-duty, half-ton pickup capability, Ram has the heavy-duty models for the game. While the light-duty Ram 1500 is all-new for the 2019 model year, the firm is testing the three-quarter and one-ton versions for the 2020 model year. The new generation heavy-work Rams will borrow the inspiration from the light-duty model redesign and improve the level of refinement, tech and capability. The engine choices will likely remain the same but with improved performance. So, if you want the heavy-duty Ram for the 2019 model year, the models will return with a few equipment and option changes while the 2020 model year will bring a fully redesigned version. Keep in mind that the 2019 heavy-duty Ram will likely be the last version with the crosshair grilles and muscular styling while the new-gen model should get the toned-down exterior and ditch the crosshair grille like the redesigned Ram 150. And in the case that you need the most of the towing capability, the 2019 Ram 2500 Diesel with the 6.7-liter Cummins diesel engine will deliver it while the Ram 3500 with the same engine will be the category above. The 2019 Ram 2500 Diesel will be the copy of the current version in terms of styling. This will likely be the last model year with the crosshair grille and the new version should adopt similar, modernized and less rugged exterior design derived from the light-duty Ram 1500. The crosshair grille will change the form depending on the trim version and there will be more chrome in upper grades combined with the chrome or body painted bumpers. The base models will have a black grille and bumpers. The wheels will also change the style and size depending on the trim option and they will measure 17 and 18 inches. The interior of the model will also stay the familiar form. The model comes with the durable and quality materials and there will also be capable Uconnect infotainment system in different configurations. The model also has easy-to-reach and use controls and comfortable seats with available luxury equipment. The cloth upholstery in lower-spec models will be upgraded to the leather textures in several variants and buyers will also be able to get the heated and ventilated front seats, heated rear seats, driver memory setting, heated steering wheel, premium sound system, Wi-Fi hotspot, and much more. There will also be multiple cab styles and configuration options. Still, the last version of this generation won’t offer now common advanced safety equipment such as the automatic emergency braking, blind-spot monitors, rear parking sensors while will include the rearview camera in all versions. The modern safety gear should appear in the new-gen version. The 2019 Ram 2500 Diesel won’t change the engine and the same but the improved version will appear in the redesigned version. The gas-powered versions should also traverse to the new generation. The legendary 6.7-liter Turbodiesel I6 Cummins engine will return with the manual and automatic transmission option. It is important as the combination with the 6-speed manual will produce 350 hp and torque of 660 lb-ft. The six-speed automatic improves the capability and ratings to 370 hp and 800 lb-ft of torque while with the Ram 3500 version reaches an impressive 930 lb-ft of torque. When it comes to the payload capability, the Cummins powered Ram 2500 will allow up to 3, 160 pounds. 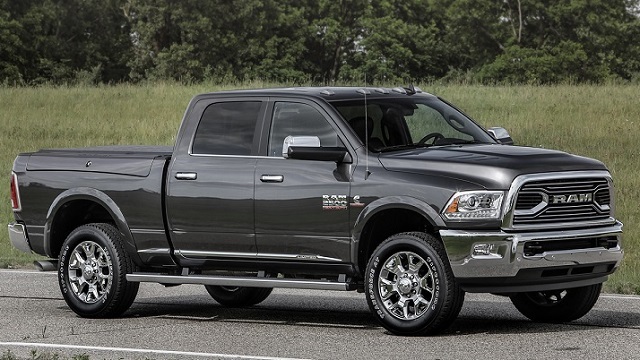 Where the diesel engine dominates is the towing and the Ram 2500 will max at 17, 980 pounds. The 2019 Ram 2500 Diesel will appear on the market later in the year. With the Cummins engine, the Ram 2500 will cost around $41, 000 and reach mid-60, 000 in best-equipped version.